After another humiliating defeat at the WACA, with India facing its biggest crisis post the match-fixing saga at the turn of the century, N. Srinivasan, the president of BCCI was seen hurrying into 221B Baker Street in central London to consult Sherlock Holmes to save the cricket and interest in cricket in his home country of India. Two hours later N. Srinivasan called the media for an announcement. 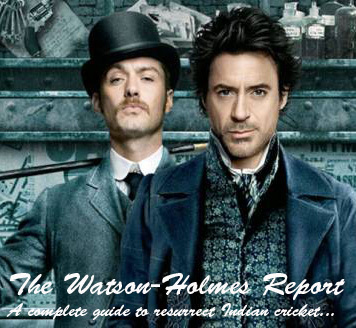 “Unlike the Argus review that spanned across many meetings involving 61 cricket oriented personnel and claimed to be independent when it involved three ex-captains in Steve Waugh, Allan Border and Mark Taylor along with former CEO of Cricket Australia, Maclom Speed, this review into overhauling Indian cricket lasted all of half hour and involved two fictional characters, Sherlock Holmes and Dr. John H. Watson. Surely, there cannot be a more independent or more competent panel to investigate the short comings on Indian cricket. And, neither was Sir Arthur Conan Doyle in anyway connected to the IPL or the BCCI,” said N. Srinivasan as a matter-of-factly. “A 2,311 page detailed report on the findings has been submitted. It is a fair and honest review investigating the issues with Indian cricket ranging from problems, issues and limitations spread across players, selectors and administrators. I am here to share a three-point summary of the Watson-Holmes report,” said N. Srinivasan pulling out copies of the summary sheet and sharing it with the gathering. There will be no standardizing of equipment and it will be left to the discretion of the Indian team management to decide per its wishes. Its batsmen can choose to wield a bat that is longer and wider than a surf board should they feel like it. Also, they can choose not to have any stumps while batting should getting bowled or out L.B.W be of concern. Batsmen out of form can ask the opposition bowlers to bowl with even a football, so that they are indeed “sighting it like a football”. 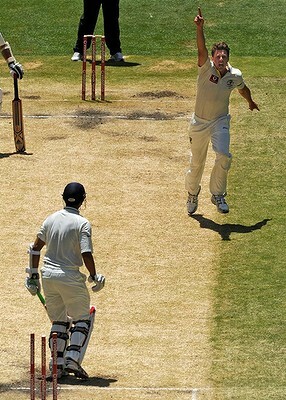 The Indian bowlers can bowl to three sets of four stumps each spread across the entire square and hit any of them and the batsman will still be out bowled. Most of the cricket boards around the world are not as rich as the franchises that own IPL teams. Also, most of them are in the docks because of infighting. All cricket boards will be auctioned before IPL V and will be run by people anointed by the franchise. That way, all Test nations come under the purview of the BCCI and all Tests and bi-lateral series be deemed “domestic games”. This will ensure the Indian domestic standards are raised to Test levels or vice-versa and no longer can India not be a winner outside of the sub-continent as any team that wins will be owned by an IPL franchise. Going forward an Indian team will lift The Ashes, Sir Frank Worrell trophy and every other trophy. And no one can say IPL is killing Tests or one-dayers any more! It is reliably learnt through cricket’s 800-plus-year journey that recorded history is all that matters. Just like we don’t know if the French lady who is first recorded to have bowled a version of cricket ball 800 years ago liked scrambled eggs or roasted bread, 400 years from now no one will want to know if Sehwag had a hair transplant, but only want to know how many triple hundreds he made. Therefore, Cricinfo’s Statsguru that is an enormous wealth of cricket’s documented history and perhaps the largest fall back option for future historians and statisticians will be owned and managed by the BCCI. Given that India is bound to be the epicenter of cricket’s financial well being in the centuries to come, it is in the game’s best interest if fans can recollect their cricket ancestors as the best in the game. It is in cricket’s best interest that future Mumbaikars recall Ajit Agarkar as someone who once scored seven triple-hundreds in a row and not seven ducks in a row. Or that Tendulkar scored more hundreds than there are hundreds in mathematics and that he managed to average a double infinity. Or than Anil Kumble twice took 15 wickets in an innings. Or that Irfan Pathan once took a hat-trick with only one delivery and so on. “The full report covers how we restructure everything with cricket – locally and globally and how we have the best of Indian and world’s cricket at heart. Even what you journalists write will be monitored and what has already been documented insofar will be doctored to best suit Indian cricket. It is after all a game and you guys don’t know how to play it. It is time we showed the world how it is played. The future will remember us as the greatest custodians of the game. And yes, we are pleased to appoint Dr. Watson and Mr. Holmes as our permanent under secretaries and all of Sir Arthur Conan Doyle’s works will also be doctored to carry out their characters as BCCI’s permanent under secretaries solving mysterious cricket puzzles including cracking the Duckworth/Lewis formula,” said a triumphant N. Srinivasan as he signed off.